For one, making a rosemary and garlic infused oil is involved. You could make this oil in advance and just keep on hand for recipes. It's a nice way to add some flavor and using it in place of the usual butter in mashed potatoes was a delicious change of pace. Secondly, roasting grapes. They go especially well with balsamic vinegar and I love how roasting grapes really bring out a complexity I was surprised to find. I'll have to see how roasting green grapes will do and pairing that with a white balsamic vinegar. Have you cooked with grapes much? Any other recipes you can recommend involving cooking or roasting them? In a large pot, add potatoes and cover with water. Bring to a boil and cook potatoes until tender and easily pierced with a knife, about 15 minutes. While potatoes are cooking, heat 4 tablespoons olive oil in a small pan over medium heat and add rosemary leaves from 1 spring, 1 pinch slat, and smashed garlic cloves. Heat until oil starts to simmer, about 3-4 minutes and remove from heat. Cover and set aside to steep. In an ovenproof frying pan over medium high heat, add 1 tablespoon olive oil. When oil is shimmering, add sausages and cook until browned on both sides, about 5 minutes. Add grapes and remaining rosemary sprig to the pan with sausage and stir gently to coat with hot oil. Sprinkle lightly with salt and transfer pan to preheated oven, about 10 minutes. Drain potatoes and return to pot. Add the garlic rosemary oil and mash well. Add warm heavy cream to make creamy mashed potatoes. Season to taste with salt and pepper. Transfer only the sausages to a platter and discard rosemary sprig. In the pan over medium high heat, add the balsamic vinegar to the remaining roasted grapes and juices. Cook until the sauce reduces, about 4 minutes. 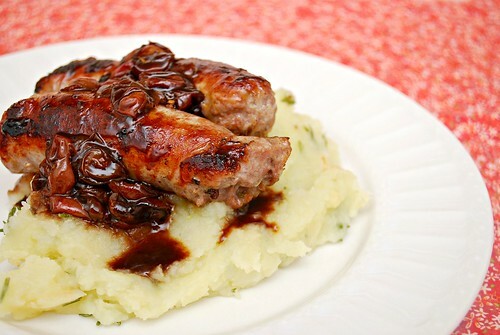 To serve, plate mashed potatoes and top with sausage, along with the roasted grape and balsamic sauce. The lover would love this..im not a big pork fan! Pork isn't usually my fave, but this looks amazing. 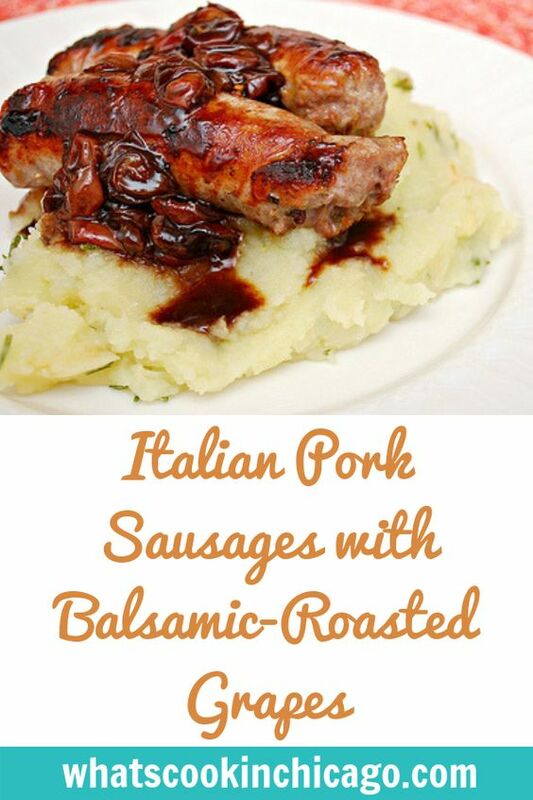 I am always looking for new ideas for dinner, and this is great! I used to use grapes more with savory dishes - chicken, pizza, it's been far too long since I've done that. I've roasted grapes with butternut squash with some oil and spices and it came out divine. I'm sure this recipe will too.. I love the grape balsamic combination...sounds delicious. This sounds so unique and exciting. my husband loves pork sausage. But we haven't tried a grape balsamic before. Now i'm curious!